and time where Catholics are being persecuted for practicing their beliefs and priests are being hunted down and executed. A notorious priest-hunter, Captain Percival Grey, is hot on his trail. Grey is a troubled psychopath, haunted by his own demons. Matters become even more complicated when Mikey finds himself falling in love with a beautiful local girl and he struggles with a crisis of faith. Should he pursue his goal and become fully ordained or should he follow his heart? Back home in Tipperary, his jealous brother is making a play for power. His sense of entitlement and irresponsibility threaten to destroy the family and, along with it, the very fabric of Gortalocca. Robert D’Arcy, once a notorious man-hunter himself, is getting on in years and has become cynical and world-weary. But he is also Mikey’s uncle and, at the request of the boy’s mother, he sets out to find his nephew and bring him safely home to Gortalocca. It’s a quest fraught with perils and D’Arcy finds himself in a life and death race against time. Can he find Mikey Flynn before the murderous Captain Grey does? 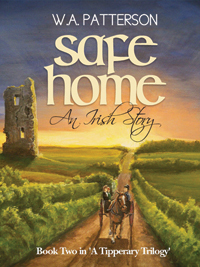 Safe Home is a fast-paced tale of action, adventure and sibling rivalry …. but it is also a heart-warming and gentle love story … a story of survival against all odds. It blends compelling fiction with well-researched fact to capture the spirit of 18th century Ireland, it tells how ordinary Irish people lived and loved and how they strive to overcome hardship, oppression and persecution.